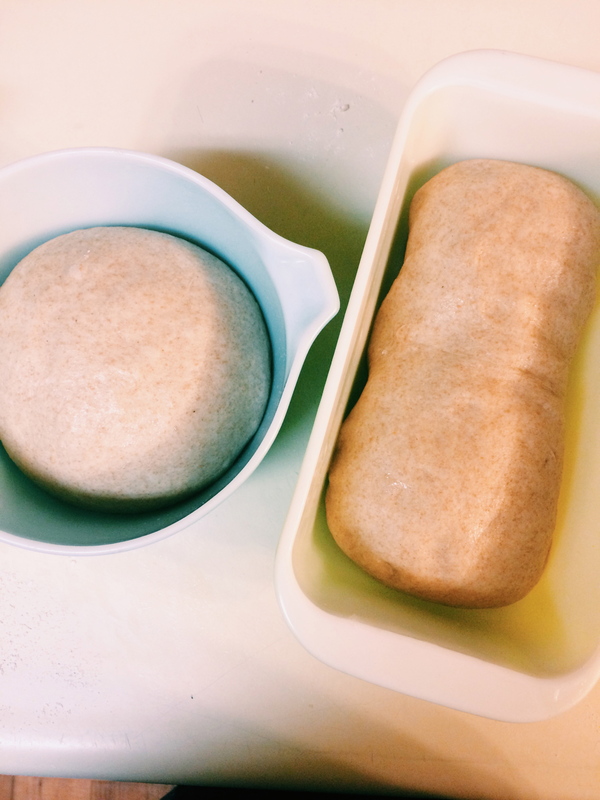 I’ve been consistently dreaming of making my own bread for years now. I keep looking for the perfect recipe that on Sunday’s I could make for the following week. If you haven’t already guessed I’ve yet to get there…it has been slow baby steps. First step I took was to stop buying bread unless I baked it myself. This worked out well except it just resulted that I never ate bread, because I wasn’t making it. The other day we had a silly little “snow day” here in Charlotte, so I decided to tackle a new recipe! 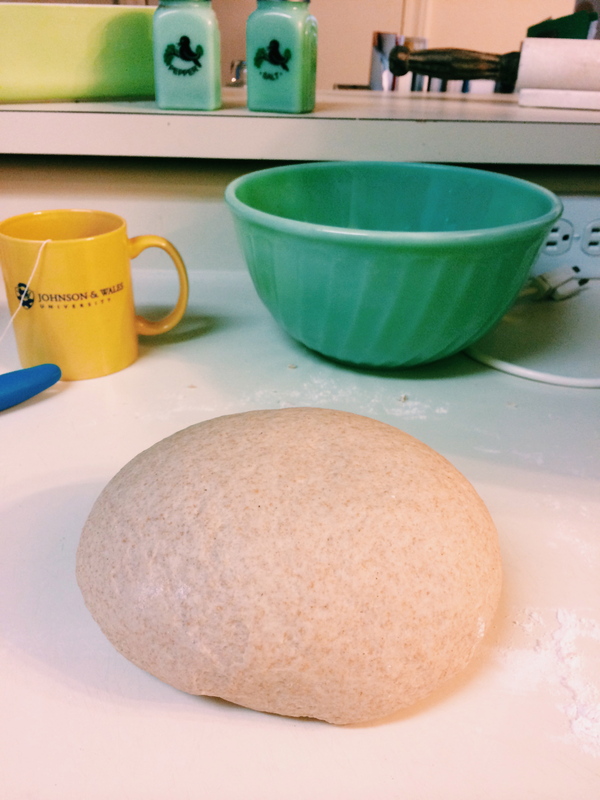 I think making your own bread each week really could impact the rest of your days. It would provide for a simpler and slower life. It would cause to you pause and not fill your day with consistent clutter. 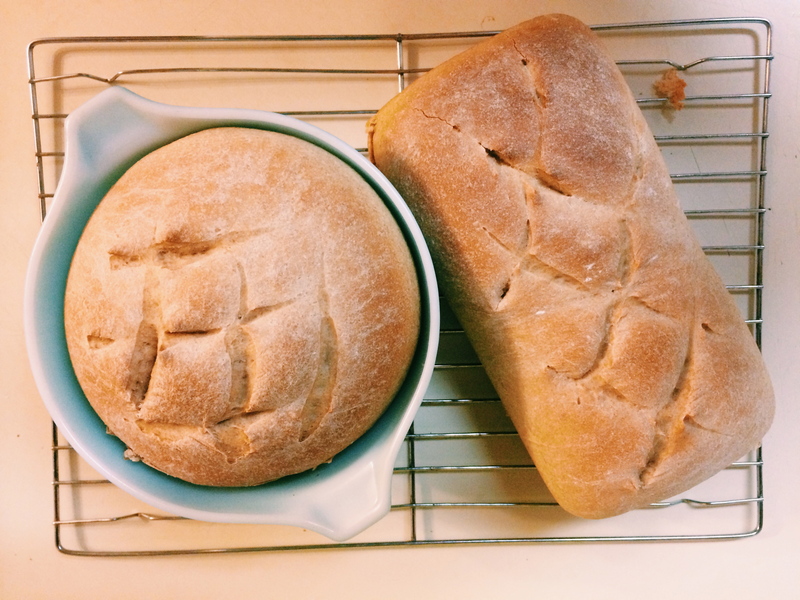 While the bread rises you could spend time reading, journaling…turning off the music and the tv. Sound therapeutic? I guess it could be, but I just think it’s nice. You know what’s going in your bread therefore in your body, you spent the time crafting it and has a result you have a wheat belly and should be proud! Silliness aside, it is more rewarding and delicious. So go conquer your fears and bake a loaf! If you happen to be a North Canton, OH reader then take notes – I used local honey from Sunoco Gas station on Main Street. Not only will they pump your gas for you, they sell delicious local honey. Go grab yourself some! I used Bob’s Red Mill, 100% whole wheat, stone ground flour. You can probably purchase it at your grocery store, a specialty food store or here. I think we will be eating this with some ridiculously spicy pulled pork I made yesterday – braised in a puree of pickled jalpenos and garlic. It’s so hot and so so good. Here’s your recipe! In a large bowl or the bowl of a mixer, combine water and yeast and set aside for 5 minutes. 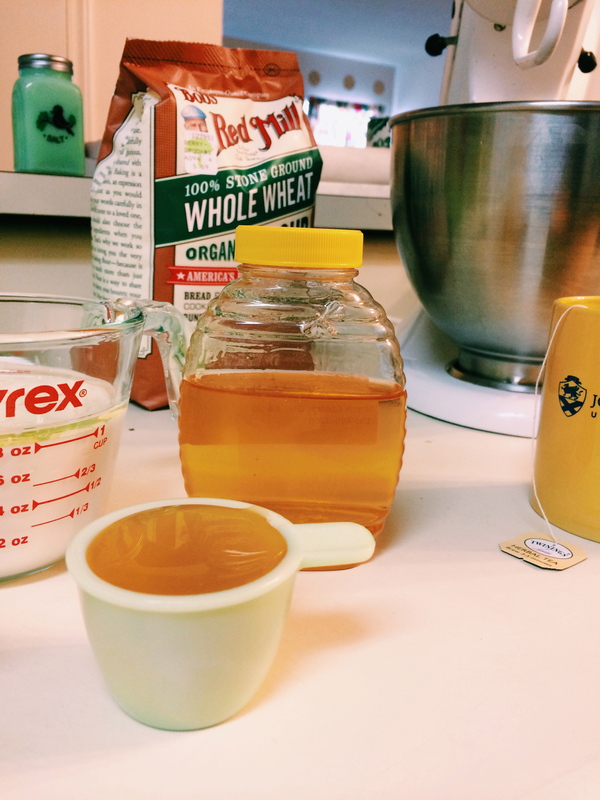 Stir in milk, honey and oil. Add all-purpose flour and salt. Stir to combine. Add whole wheat flour and stir by hand or with dough hook until a dough forms, about 1 minute on low. 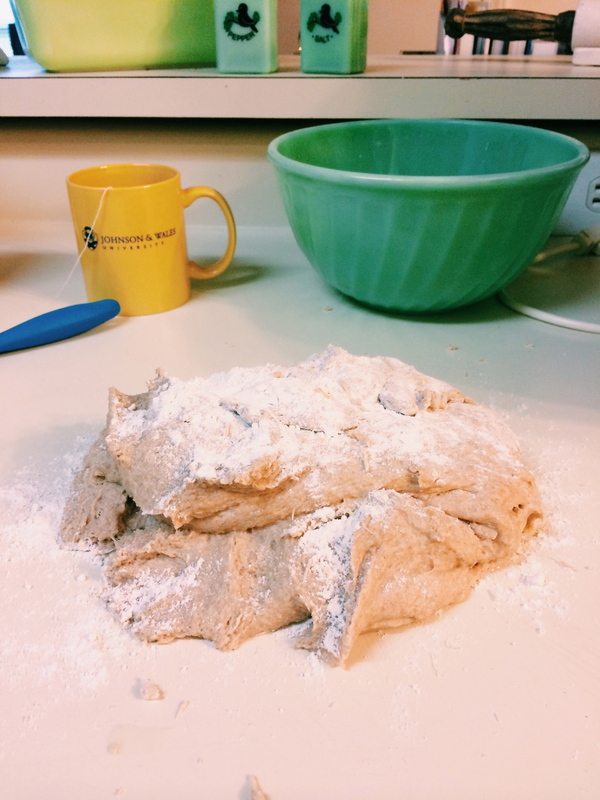 Knead dough until smooth and springy, about 1- minutes on medium speed. Form dough into a ball and place in a large bowl lightly coated with oil. Turn dough to coat. Cover and let rise until doubled in size, about 1 hour. Make 3 angled slashes on top of each loaf with a knife and place in oven. 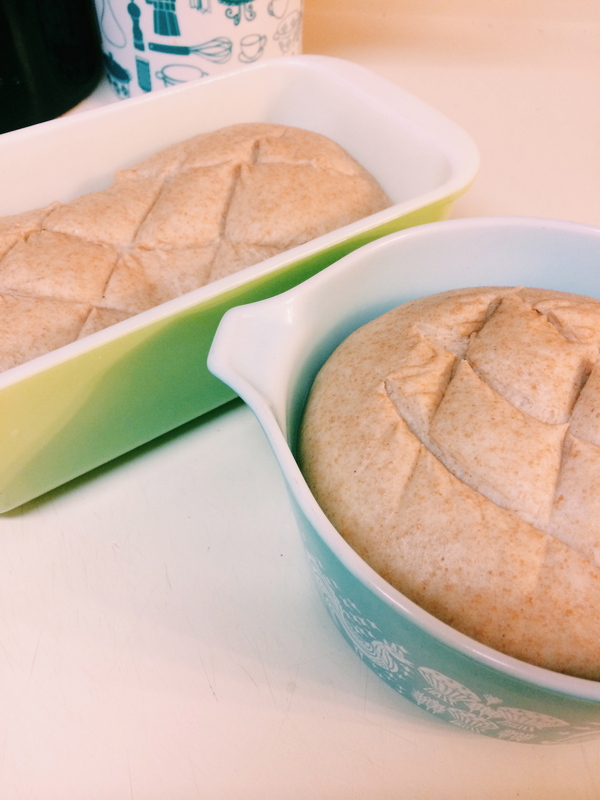 Immediately reduce heat to 375 and bake until loaves are folden brown and sound hollow when tapped, about 30 minutes. Remove from pans and let cool completely. Makes 2 loaves. Let us know your results or what you serve it with!